Guam belongs to a chain of islands now called the Mariana Islands. These islands are part of a widely spanning region of mostly very small islands, collectively refered to as "Micronesia." 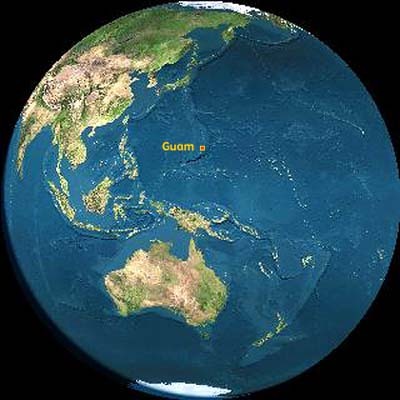 Located towards the Western end of Micronesia, Guam is fairly close to Asia. It is only a 3-hour flight to Guam from Tokyo. The Mariana Islands have been inhabited by Chamorro peoples for over 4,000 years. They are known for their monolithic structures called latte stones (pronounced "latti-e"), remains of which are found throughout the archipelago. The Marianas also have the dubious distinction of being the first islands encountered by Europeans. Magellan landed on Guam in 1521, and were colonized by Spain, mostly during the 17th century. Guam became a stop on the Manila Galleon route (between Acapulco, Mexico and the Philippines), and became an important mission for the Catholic Church. Now people reside almost entirely on the southernmost islands. This is due in part, as we will hear, to intentional Spanish policies to relocate the Chamorro peoples so they could be more effectively controlled. In 1898 Guam was ceded to the United States, following the Spanish defeat in the Spanish-American War. The rest of the archipelago, now called the Northern Mariana Islands, was sold by Spain to Germany. They were subsequently acquired by Japan at the end of the first World War, and then became part of the U.S. Trust Territory of the Pacific after World War II. Since the Spanish resettlement of peoples in the Mariana Islands, Guam has been divided into a number of "villages." These are administrative divisions of the island, sometimes covering fairly large areas, and may contain more than one actual settlement area. This entire municipality, however, is still called a "village." Inarajan is one of three "Southern Villages" including Umatac and Merizo (Malesso' in Chamorro). The Southern Villages are known for being more traditional, with the culture more intact. Inarajan is the largest of these three villages, and includes the "village proper" which is the Spanish-style settlement on Inarajan Bay. This overview and history tells us only a little about Chamorro culture and the peoples of today. This bird's eye view is a good introduction, but doesn't give us much sense of place. 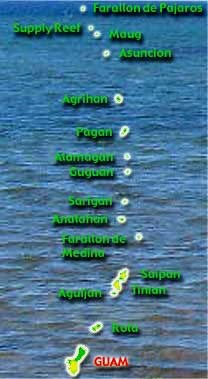 Let's zoom in to Inarajan and orient ourselves to this island location.